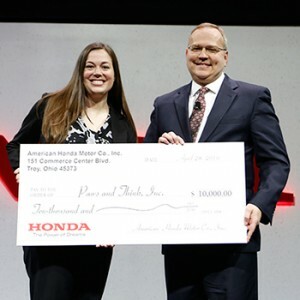 Pictured (from left): Kelsey Burton, Executive Director, Paws & Think; Steve Bailey, Vice President-Parts Operations, American Honda Motor Co.
Indianapolis, Indiana – May 27, 2016: American Honda Motor Co., Inc. has donated $10,000 to support Paws & Think. This is the largest single corporate gift in recent history for Paws & Think. This gift was given as part of the 2016 American Honda Supplier Conference. Each year, American Honda donates to one local non-profit serving the conference’s host city, with this year’s host city being Indianapolis. In addition to the donation, Paws & Think’s Executive Director spoke to over 700 suppliers at the Annual Business Meeting and therapy teams consisting of a therapy dog and his/her handler provided on-site stress relief during the conference. Paws & Think is a volunteer-led non-profit dedicated to improving lives through the power of the human-dog connection. Paws & Think partners with schools, health care facilities, the Marion County Juvenile Detention Center, humane societies/shelters and other organizations to improve the quality of life for at-risk youth, seniors, people with disabilities/special needs and others who can benefit from interacting with the dogs in its programs. The organization was incorporated as Paws and Think, Inc. in 2001. To learn more about Paws & Think, please visit the organization’s website at www.pawsandthink.org.